Including C. nitidula of Michigan Flora. Forests (beech-maple, oak, aspen, jack pine) and borders, swamps, river banks and bottoms; roadsides, fencerows, fields. A common and readily recognized species that can grow to considerable size on rich bottomlands, but survives also on dry hillsides. The leaves of vegetative shoots usually have distinct, narrow, acute lobes, although those of the flowering branchlets are at most indistinctly lobed near the apex; they are duller than the shiny leaves of the somewhat similar C. crus-galli. Yellow fruited plants (f. aurea (Aiton) Rehder) are perhaps seen more frequently than in any of our other species. 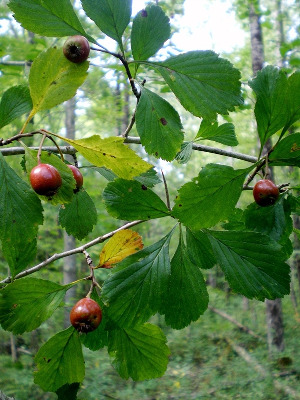 Crataegus nitidula may be an aberrant form of C. punctata or a hybrid with some other species. MICHIGAN FLORA ONLINE. A. A. Reznicek, E. G. Voss, & B. S. Walters. February 2011. University of Michigan. Web. 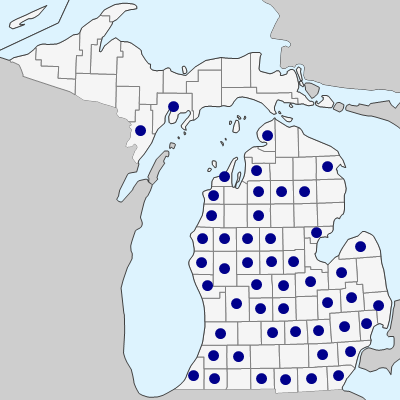 April 21, 2019. https://michiganflora.net/species.aspx?id=2473.